Method papers can be pretty frustrating to write: they rarely do justice to the amount of work needed to develop a new technique and present only the final, fully troubleshot, version of the work. However, we all know that a lot of trial and error is usually involved in developing a new method. All these details are often very important to fully understand how the method actually works. Our recently published manuscript presenting the newly developed In Situ Chemotaxis Assay (ISCA) is no exception; here we present the story behind this paper. Roman Stocker and Justin Seymour's vision of an in situ device that could quantify bacterial behavior in natural ocean environments emerged in the final days of Justin's post-doc in Roman's lab at MIT. 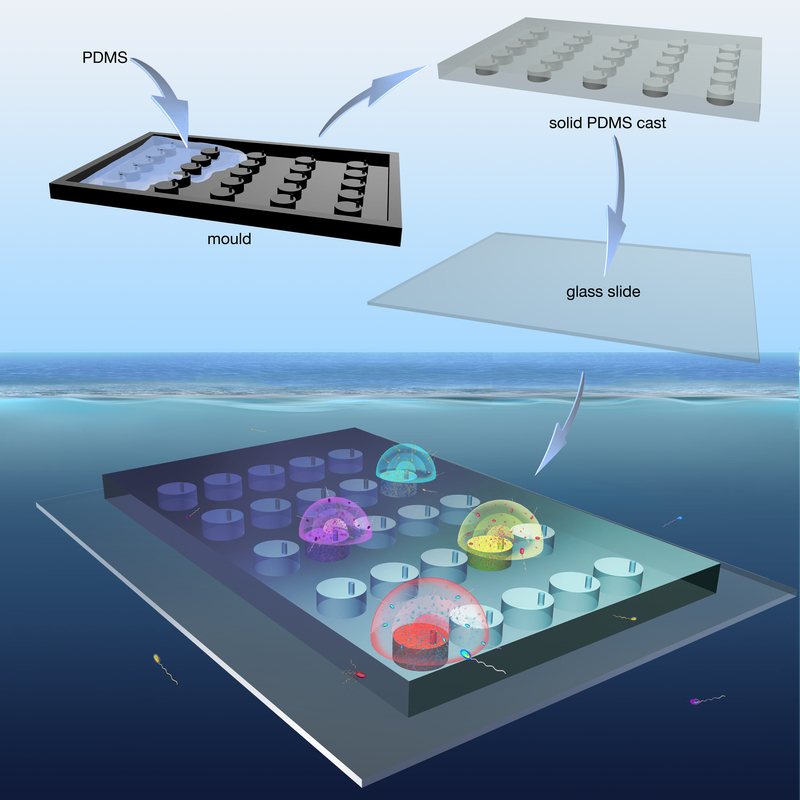 They had been successfully assaying bacterial chemotactic behavior in the laboratory using microfluidic devices during the previous 3 years, and were eager to continue their collaboration by moving these measurements from the lab with bacterial isolates to the ocean and natural microbial assemblages. As with many great ideas, the first outline of the ISCA was drawn on a napkin during a lunchtime meeting on Justin's last day at MIT in 2009. The project took a couple of years to get off the ground and method development started in 2013, thanks to support from the Gordon and Betty Moore Foundation. Initially, all microfluidic platforms used in the Stocker lab were made out of polydimethylsiloxane (PDMS) cast onto SU-8 moulds. This toolkit is generally enough to pull off most microfluidics experiments, but there was a catch – the size of the ISCA features were too large and this led to the silicon mould breaking repeatedly. We therefore started to search for other approaches that could circumvent the traditional photolithography process. Our answer at the time came in the form of laser-cutting. We decided to fabricate the device out of three acrylic layers and bond them together using dichloromethane (DCM). Although this simplified fabrication, the device didn’t work whatsoever. In retrospect, it was likely due to the uneven seal provided by DCM, together with chemical signals resulting from plastic melt after exposure to DCM. As a result, we started to think of ways to bond laser-cut pieces without the use of an adhesive. Here we got deeper into the rabbit hole of computer controlled fabrication and started employing waterjet cutting to make neoprene gaskets, which would separate the port layer, through which attractants diffuse and microbes enter, and the bottom acrylic layer, which served as an anchor point for the nylon bolts we were employing at the time. This allowed us to screw the device together and forego the harsh chemicals present in the previous design. This device was a marked improvement, with some chemotaxis being observed in laboratory experiments. Unfortunately this wasn’t a happy ending and we soon realized that this prototype had many flaws. The device could not be easily sterilized, and the assembly of the three layers was particularly time-consuming and frequently resulted in an imperfect seal between the acrylic and the neoprene gasket. This could lead to strange flow dynamics that completely disrupted validation experiments and led to some nonsensical results. At this point, we began to search for a technique that would allow us to build a monolithic device. The very first prototype made out of PDMS was so far the easiest to use and most robust (if you disregard the mask fragility), so we wracked our brains trying to think of a solution. 3D printing had been all over the news and technical journals, with printers boasting specifications that were unheard of when we began the project. With this in mind, we set out to test whether a 3D printed mold would have the ability to resolve the finer features of the device and have a smooth enough surface for a soft lithography workflow to follow. To our joy it did! All through this iterative process we had been considering how many ports to include within the device. We had run some COMSOL Multiphysics simulations that indicated any number of ports greater than 1 could lead to fluid flow through the interior of the device, which would result in flushing of chemoattractant and the responsive microbes. We had retained a second port because we needed a way to vent air as the device filled, but fortunately with the new monolithic PDMS device we were able to fill through a single port by using a fine syringe. It was at this point that the device began performing reliably and we were ready to validate it in every possible manner. We started this battery of tests by ensuring that under laboratory conditions we had a device that worked perfectly. By reducing the footprint of the ISCA and placing it into a microscope stage-top microcosm, we were able to test a variety of biological parameters without having to worry too much about fluid motion. The question that was first and foremost to go after was ‘how well can microbes chemotax into the device?’ For this purpose, we selected a model organism that the Stocker Lab employs in a number of studies, Vibrio coralliilyticus (YB2; courtesy of Assaf Vardi from the Weizmann Institute of Science), which is a fast-swimming chemotactic bacterium that also has the major benefit of expressing DsRed at very high levels. We imaged these cells as they swam into the device in response to diluted culture medium or a control, and after some image analysis we wound up with the red and black curves in Fig. 1b of the published manuscript. Because non-motile cells are numerically dominant in many aquatic systems, we also wanted to know how many non-motile cells might enter our device through Brownian motion. To figure this out we used a fluorescent Marinobacter adhaerens (courtesy of Matthias Ullrich from Jacobs University) that was missing a gene that encodes for fliA (necessary to synthesize a flagellum). The result of this experiment was that almost no non-motile cells appeared within the wells, which is of major benefit considering their abundance in the environment. Finally, we carried out experiments with a fluorescent E. coli responding to a non-metabolizable chemoattractant, for comparison with the numerical model we developed in COMSOL. Luckily, we saw good agreement between the model and the experimental results, and this reaffirmed our belief that chemotaxis was the dominant process occurring. As soon as the ISCA started to provide robust results, we launched the first field experiments to validate its capability as a chemotaxis assay in the wild. The first challenge was to prevent the chemical signals emanating from the device from being completely swept away by local fluid flow. We therefore decided to protect the ISCA in a flow-damping enclosure, which also went through several iterations. 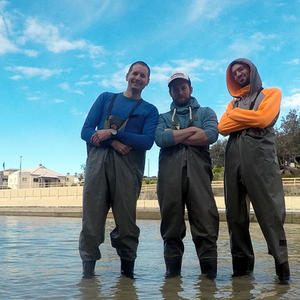 Most of the field work occurred in Sydney, but some test sampling was also carried out in other locations. In all field experiments, we deployed ISCAs for 1 hour before retrieving the contents of each well, which were used to simultaneously determine: (i) how many bacteria swam into a given treatment (counting responding cells via flow cytometry) and (ii) who they are and what they can do by extracting and sequencing their DNA. Excitingly, natural communities do exhibit strong chemotaxis and we were able to capture this behavior with the ISCA. Even more exciting, is that from our sequencing results, we see a definite enrichment in motile and fast-growing cells. This strongly suggests that these motile cells are searching for nutrient patches within the water column through motility and chemotaxis. The ISCA could not only serve as a powerful selection platform for isolation work and bioprospecting, but it is also a highly flexible device that can be coupled with many downstream genomic analyses, especially in this day and age, where the lower bounds of input material are rapidly evolving. We are currently deploying complex chemical mixtures, of organic matter or host material, combining the ISCA with metabolomics and low-input metagenomics. The depth of information provided by the combination of these techniques is stunning and promises to enable resolution of complex chemical interactions in different ecosystems. Through the course of development we strived to make a device that was widely accessible. As a result of the device’s simplicity, a great thing has happened. We’ve now been approached by a large number of microbial ecologists and microbiologists who hope to use the ISCA in lab or field settings, either for isolation work or to assay chemotaxis with greater ease and flexibility than the capillary assay. Image credit: Glynn Gorick, Jean-Baptiste Raina, Bennett Lambert, Justin Seymour, Roman Stocker. In the end, we hope that by focusing on simplicity and ease of use we’ve created a device that scientists from diverse backgrounds will feel comfortable adopting and using to its fullest potential. Great to read the backstory behind the development of this exciting new tool, thanks for sharing here!